20 points can be awarded to your webstore account (see FAQ). 2017 - New artwork reminds you of the relative size of some common contaminants on the record surface. Includes a toothbrush-like accessory to aid in removing dust buildup from the tool. Carbon-fiber bristles on the edge of the velvet pad help the aluminum body discharge static electricity through your hand and then eventually to "earth ground" if you are grounded. 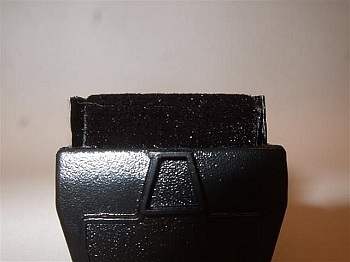 Velvet pad whisks away embedded groove dust etc when used as intended in a circular motion following the grooves. Ships in ziploc bag to save shipping and reduce waste. Thousands of fibers reach down into the grooves of the record to remove dust. At the same time the brush dramatically reduces static electricity, a big cause for pops crackles and other unwanted noise events. Quick and easy to use, requires no liquid, just a few rotations around the record before each play and its done. The protective metal wall mount bracket clicks/snaps onto the ends of the tool to protect the bristles and pad while not in use. Yes this really is the exact same brush as sold under other fancy names like Hunt: EDA Mark 6, & AudioQuest,. All, including ours are made in China. Does a much better job than my old one that did not have the carbon fibers. These lift off the dust well after you finish going around the LP. Ordered this brush because the other less expensive product was backordered. This one works fine, although most of the cleaning is done by both of the carbon bristles. The felt across the center doesn't get used very much and requires a little extra pressure to contact the vinyl surface. I find the Dust Jockey more effective than ordinary carbon brushes. 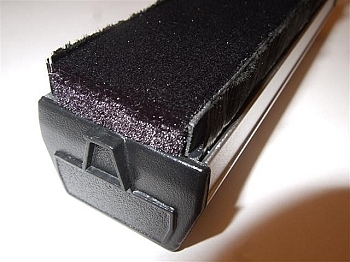 The center soft pad is supporting the long carbon fibers and help to keep the long fibers up-right and this way the front row of fibers collect the dust rather than bending and pushing the dust down into the tracks. I mulled back and forth between this brush and the ones on Amazon. I couldn't be happier with the Dust Jockey. It works great and the improvement in sound quality is immediate. It removes an impressive amount of dust from the grooves; you can watch a record's dust build up quickly on the Jockey. If you have old records, a brush can help more than just a cloth. The large surface area cleans quickly, but will slow down a turntable if you're cleaning it that way. Makes quick work of dust and dog hair, of which I have PLENTY!!. No need to spend more for other similar brushes. I love the Dust Jockey! It gets the dirt out of the grooves and discharges static electricity. It is great! Really nice item that appears to clean even the oldest records well. Dose not work as well as my old disc washer from the 70's but better than others I have tried. The record cleaning brush is easy to use and effective. One circular wipe is usually enough to pick up the dust and neutralize static, on LPs and 78s too. I've been eager to find a product that will replace my aging Disc Preeners and this surely is it. My records are in bad shape. This little brush helps a little. Great for cleaning surface dust. Does what it's suppose to do. It does seem to get some static out if it's not too bad. I would recomend this for surface cleaning of light dust before playing your vinyl which is what it's for. So far so good. I haven't used it for long enough to say anything about its longevity. A pleasant surprise was that the brush holder comes with a screw hole so one can mount the brush on the cabinet of a shelve. I received a little stylus brush, too, which I was not aware would come along. Very effective at cleaning very dusty records. Would recommend.